I'm Proud of these Podcasters! If you haven't listed to Live from the WB yet, you need to subscribe right away (if you have iTunes, just go to the music store - go under podcasting - and do a search - it's 100% free). 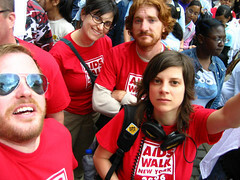 In their latest episode (they are up to #14) they depart from their usual studio format and take it to the streets - this entire episode is done free form and features their rants and raves as they wander about the AIDS Walk in Central Park. What's very cool is that our local Williamsburg podcasters have used their show to raise funds for the walk which is very cool in my book. This episode was very free form, sort of like a "White Album" meets "Nirvana Unplugged" meets Williamsburg. This page contains a single entry from the blog posted on June 6, 2006 5:19 PM. The previous post in this blog was Coffee makes us more likely to say 'Yes'. The next post in this blog is Go Go Go Williamsburg!.